Come stay at the beautiful Casa De Emdeko oceanfront condo complex! Very nice one bedroom, one bath ground floor garden view condo unit sleeps four. Recently updated kitchen features granite counter tops, stainless steel appliances and a brand- new refrigerator. Fully equipped with automatic coffee pot, toaster, microwave, combination rice cooker/slow cooker, blender, mixer, and coffee grinder. Perfect as your home away from home. Convenient ground floor unit is located on the south side of the complex and is accessible without using any stairs. Bedroom has a king size bed and the living area has a queen size sofa bed. Central AC, flat screen TV, washer dryer, cable and free high- speed internet included. Mini fridge in living area is a convenient place to keep cold beverages just inside the sliding door to the lanai. Perfect for couples who like to cook or a family of four. Complex is conveniently located approximately 1 mile south of downtown and a short distance from great restaurants and beaches. Features two pools: a freshwater garden pool and a saltwater pool built on the very edge of the ocean. Next to the saltwater pool is a sandy sunning area with lounge chairs under tall palm trees which is a great place to watch dolphins swim by in the morning and the beautiful sunsets in the evening! Complex features a small deli/convenience store located just outside the security gate. This unit's lanai features new patio furniture and is right next to the fresh water pool and the beautiful tropical courtyard. Cabana area has three gas grills and patio tables for dining along with complimentary fresh coffee every morning. One unassigned parking spot is provided. Maintenance Notice: The Association will be renovating tower walkways with work scheduled to begin on approximately May 15, 2018, for stacks x04 to x09. The construction period is expected to last for approximately 2½ months. Stacks x10-x11 and x12, x14 and x15 are scheduled for next year at the same time. Please inquire with KCV for details. Thank you for your patience while this project is being completed. Kona Coast Vacations hosts over 5,400 reservations a year with the help of knowledgeable management, proficient team members and trusted home owners. Open 7 days a week, we strive to help with each visitors' every need. Sharing Aloha from the first contact whether it is phone or email, we are here to assist by making the booking process as seamless as can be. We pride ourselves on providing hands on assistance whenever it is needed, whether it is reservation details, maintenance issues, or even booking activities! 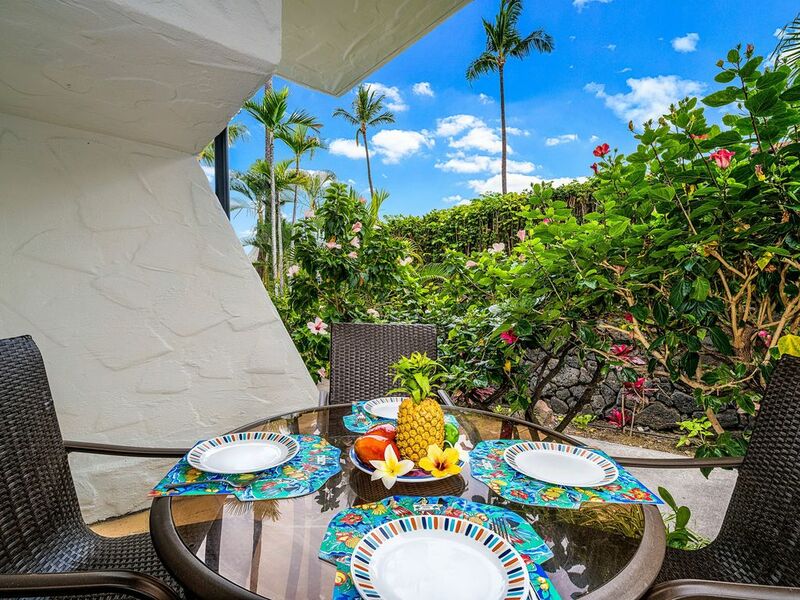 Kona Coast Vacations is fortunate to team up with great property owners which is instrumental in providing exceptional homes for our new and returning guests. With over 240 vacation rentals from oceanfront homes, ocean view condos and private estates, we are here for your every need, open seven days a week to take care of our guests and owners. With two locations in Kailua Kona and Mauna Lani we have dedicated specialists in guest services managing reservations, maintenance, and property checks alongside our accounting, support and marketing specialists. We are proud to be a VRBO member since 2001 and hold Premier Partner standings. We hope to host you in Hawaii and help create a memory to last you a lifetime. We are your “'Ohana” (family) on the Big Island of Hawaii, please do not hesitate to ask us any questions regarding properties or activities. Love the sandy patios and the salt pool for cooling off. Stayed two weeks and found the unit to be a wonderful home away from home. Everything in the unit was clean, well stocked, and well taken care of. Being plant based eaters, we were specifically looking for a unit with a good kitchen, and we loved the updated kitchen and the quality cooking utensils that were supplied. We were even able to find some great Vegan restaurants in the Kona area (make sure you check out Herbivores and Evolution Bakery!). The Case de Emdeko facility is beautiful and well cared for. The salt water pool is amazing! They have a very friendly team of people who are constantly making sure the area is clean and well maintained. Before we booked, we had noticed some comments about noise levels and parking issues, but we personally didn't have any issues with parking or noise. Because the Condos are set back away from the main road, you do not have any of the noise from Alii Drive. Even with this unit being right next to the middle swimming pool, we still did not feel there was noise issues. A huge plus is that we were able to hear the waves crashing each evening as we lay in bed. Personally, we feel this was a great place to stay, and a great experience. Both my wife and I will highly recommend to our friends, and will plan to return! Thank You!! !